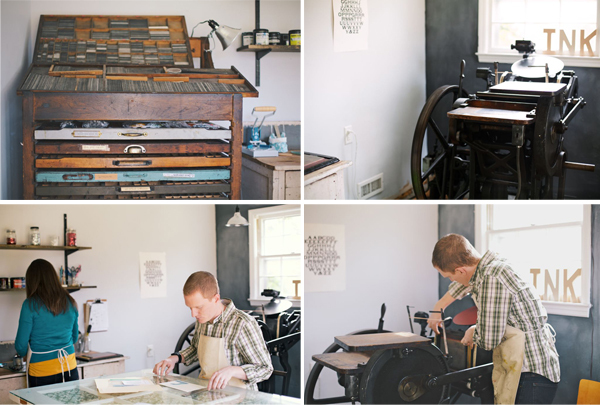 If you’ve followed the world of letterpress this past year, you’ll recognize Daniel and Allison Nadeau, the pair behind Ink Meets Paper. The former designer & English major team turned letterpress powerhouse become a duo to watch this year, as their innovative “Every Card Has A Story” films (which capture the detail and work that goes into each piece) are receiving rave reviews. Their work is as sharp as an X-acto, colorful as a Pantone Color Guide, and they’re a team with a penchant for letterpress brilliance. Daniel and Allison sat down between runs to talk shop and about the little things of letterpress that make their world go ’round. 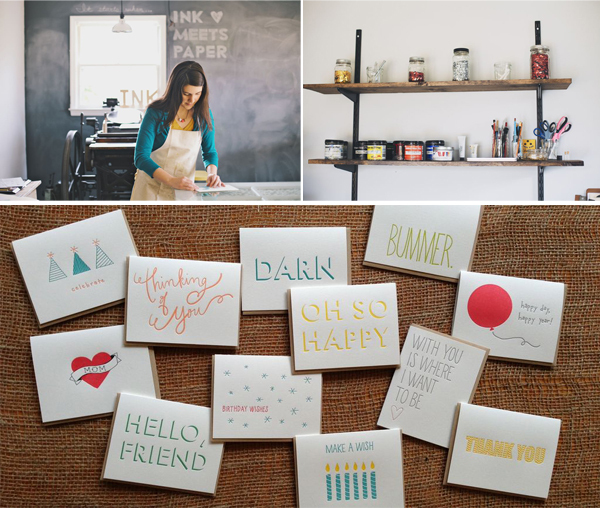 And don’t forget to say “Hi!” to them as they’ll be making their first National Stationery Show appearance in New York City this coming May (Booth#2267)! CLOSE UP WITH DANIEL & ALLISON We’re husband and wife, Daniel and Allison Nadeau. Daniel’s background is product and interaction design, and I was an English major. We grew up in Nashville, TN, spent a few years in Savannah, GA, and ended up in Charleston, SC. 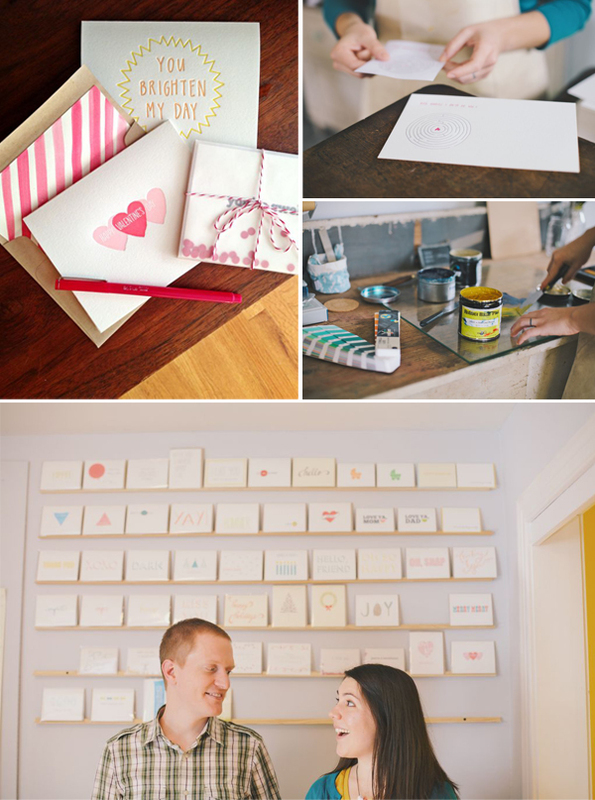 FROM CORPORATE TO CREATIVE Our interest in letterpress started with a desire for hands-on interaction and creation. We both had corporate jobs where we sat in front of computers most of the day, and longed to create something more tactile and physical. 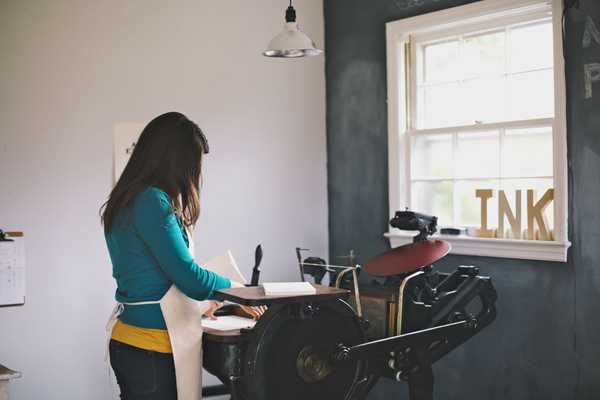 After taking a printmaking and letterpress class at a local art studio, I was hooked. PRINTING IN THE PALMETTO STATE Our shop is in our house, which is in the Park Circle community of North Charleston, SC. We had initially looked into renting a storefront studio space, but the timing just didn’t work out. Instead of continuing the search, we converted a spare bedroom into a studio (added French doors to allow access for the press, pulled up carpet to expose the concrete floor, and added a concrete overlay). Keeping the studio in the house was probably one of the smartest moves we made. It allowed us to grow slowly (without stress from additional rent) and made it easy to print at crazy times (we both had other full-time jobs at the time, so there were many late nights printing). The studio is also climate controlled, which is a huge perk for the hot, humid Charleston summers. We’re lucky to have lots of natural light and a really nice view of the backyard. THE CREATIVE PROCESS We are always creating. Our greeting card line keeps us pretty well aligned with the retail industry in terms of product releases ( i.e. Christmas cards in May, Valentine’s cards in September, and so forth). Daniel and I usually run through sketches, concepts and ideas to narrow down a direction and refine from there. Most of our card designs are hand drawn first, and then scanned and vectorized to be made into photopolymer plates. Our production process is a bit different, as we are really interested in the dialogue that occurs when a customer wants to learn more about the card they purchased, or received. One of the ways we have addressed this dialogue was to create Card Stories. We make a unique video story for each of our card designs (accessed by scanning a code on the card back or by entering the Story Code number at our website). This meant, as we printed, we would also film (and eventually edit) the printing process. As our volume has increased, we are working to find other ways of letting our customers know what goes into each card. Our mobile site has always been closely tied to each product, and we’re excited to continue exploring how the digital and physical can support one another. FULL TIME FUN We’ve both been focused full time on Ink Meets Paper since January of 2012. We also work as graphic/web design freelancers, and Daniel does programming as well. PRESS HISTORY Summer of 2008 became the season of the great printing press search. We scoured forums and Craigslist ads throughout the South, hoping to find a floor-sized platen press. Daniel was so set on finding one that he made a list of every antique store in the state. Finally, we located an 8×12 Chandler & Price at a print shop in Jacksonville, FL that was closing out the letterpress portion of its services. Hearing stories from and talking with a third-generation printer was an incredible experience– such knowledge and so much history. Good friends helped us move the press back to Charleston (and let us keep the press in their garage until we worked out a studio space). PRINTING FEATS Probably our biggest accomplishment is that we’re both self-employed and working together. While it’s challenging at times, it’s so rewarding to be able to work from a home studio, refine our business, and explore new opportunities with each other. We are so honored to be a part of the letterpress community, and have always found everyone to be open and willing to share knowledge. 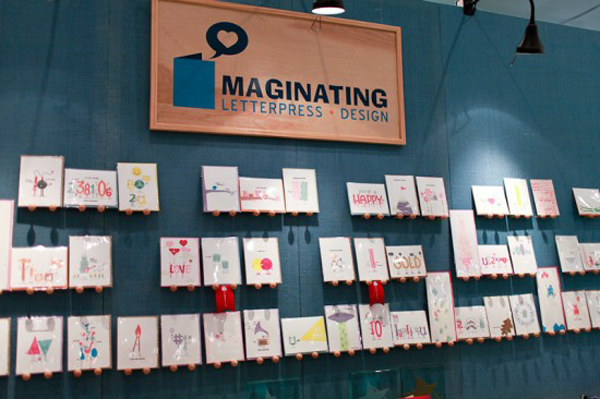 To complement fantastic sites like Letterpress Commons, we also organized the Letterpress Hotline in early 2012. It’s a volunteer-run telephone helpline so printers can call and talk to another printer if they’re ever in a sticky situation. BOXCAR’S ROLE We use a Boxcar base and order our plates and ink from Boxcar. Boxcar’s top-notch customer service and easy online ordering mean our plates are one less thing we have to worry about. Not to mention, Boxcar’s online letterpress training videos and press manual PDFs (now a part of the Letterpress Commons) were extremely helpful as we were venturing in to the crazy world of letterpress printing. We’re big proponents of sharing information and helping others and love that Boxcar holds those same views. 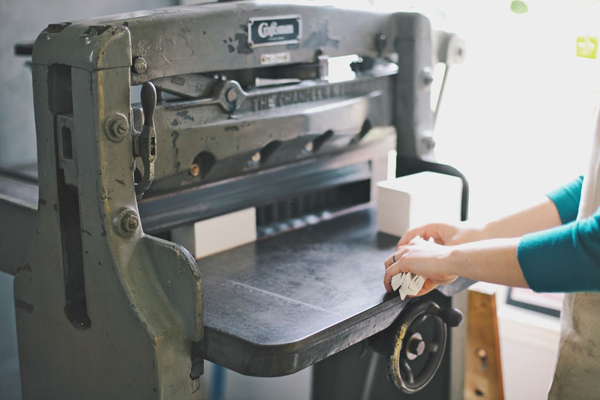 SHOP TIPS Be thoughtful and don’t be afraid to go slowly (both in business and in printing). 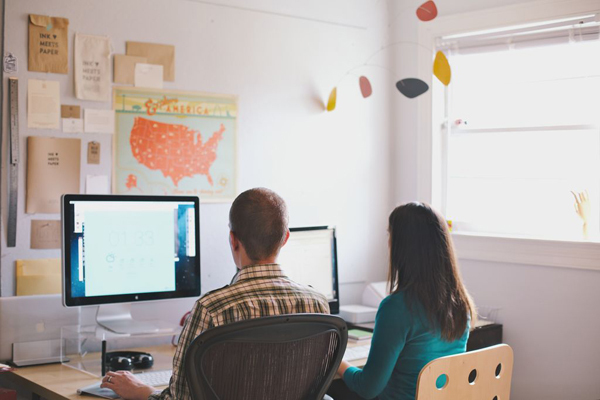 Building a business takes time, and it doesn’t happen overnight. 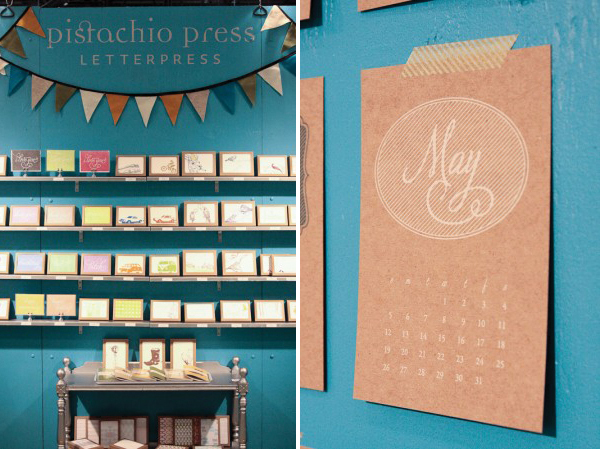 WHAT’S NEXT Ink Meets Paper will be making its first appearance at the National Stationery Show in May, Booth#2267. 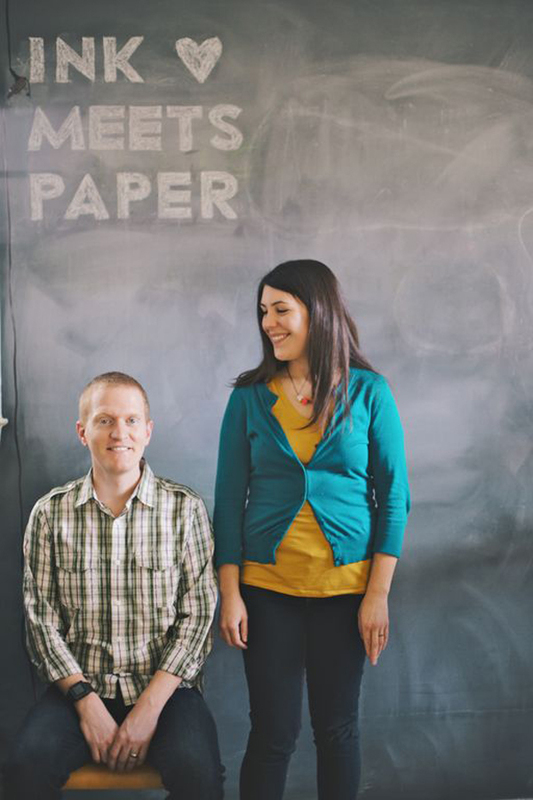 A big round of thanks out to Daniel & Allison for letting us get the full story on Ink Meets Paper. Photography courtesy of Olivia Rae James. While in New York City recently for the National Stationery Show, we found that not everything inspiring was happening just inside the Javits Center. With a sharp eye, there was some appealing typography in signage that was spotted during our travels. We all can appreciate a well turned font and a clever capital that gets the message across. Shown here are just four images we snapped, but we also recommend checking out the artful NYC Type, a site that reveals some of the classic lettering hidden high and low along the streets of New Y0rk City. Click on each picture on the NYC Type website for the location of each photo. 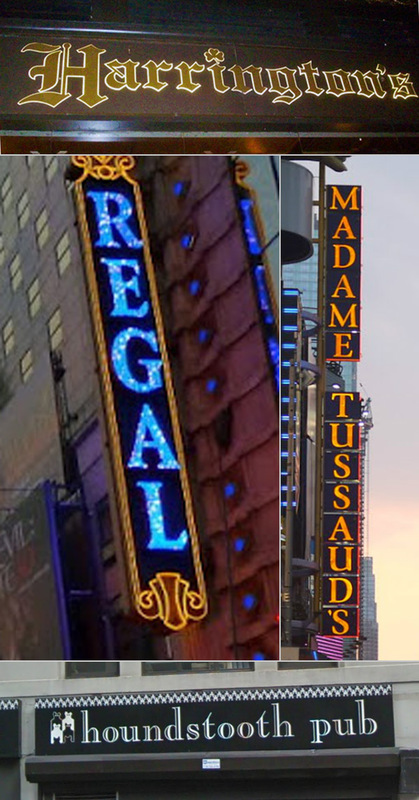 Clockwise from the top: Harrington’s Bar & Grill on 7th Avenue | Classic serifs on 42nd Street with Madame Tussauds | Houndstooth Pub on 8th Avenue | More serifs grace the Regal Theatre marquee.